Super moist, super fudgy and slathered with a thick layer of cream cheese chocolate frosting – these brownies will be your new favorite. I have a love affair with brownies. Fudgy, dense, chocolate-y. I’d opt for Birthday Brownies instead of Birthday Cake any day. Now – I love my Triple Chocolate Brownies but recently I’ve been on a quest to create the ultimate fudge brownies with chocolate frosting. Brownies that are chewy, fudgy, super moist AND can smothered in a thick layer creamy chocolate frosting without being too sweet. You see, my Triple Chocolate Brownies are the type for eating with a spoonful of ice cream and chocolate sauce. But sometimes you need that classic frosted brownie like the ones you buy in a giant slab from the corner bakery. And today – I have the perfect recipe. They’re dense, fudgy and have a delicious chocolate flavor without being too rich or bitter. Then to top it all off, they’re frosted with cream cheese chocolate frosting. The slight tang of the cream cheese pairs so perfectly with the chocolate and balances out the sweetness. And because cream cheese frosting > non-cream cheese frosting. These really are the perfect fudgy frosted brownies and they aren’t the least bit cakey or dry. So let’s go through what makes them so dense & delicious. First this recipe uses cocoa & lots of butter. I wanted to use cocoa so that you can quickly whip them up the moment the craving hits – without having to go to the grocery store to buy dark chocolate. However, because we’re using cocoa we need to add in extra butter for more fat. Then an extra egg yolk adds even more tenderness, and brown sugar for more moisture. I stuck to a combo of brown sugar & granulated/caster sugar as to not stray too far from that classic brownie recipe using all granulated sugar – but the brown sugar definitely adds to the fudginess. Then for the final secret ingredient – we’re actually adding a little corn syrup to the batter. It seriously ups the chew factor. It’s also very important not to over mix the batter. Otherwise – they your brownies can go from fudgy to cakey pretty quickly. Say goodbye to the electric mixer. And last but not least, be careful not to over bake. The difference between a few minutes can take a deliciously fudgy, moist brownie to dry and tasteless sad brownie. So watch carefully and don’t be afraid to take them out of the oven a little early – they’ll continue baking as they cool in the pan. And then that frosting – Oh my…. I’ve honestly debated if I should even make the brownies and not just go straight for this Cream Cheese Chocolate Frosting. It’s creamy. It’s not too sweet. And it’s so delicious. You’ll notice that the recipe makes a rather large amount – but I don’t think anyone will be complaining about the thick slather of frosting on top. Fudgy Chocolate Brownies with Chocolate Frosting…. It’s LOVE. 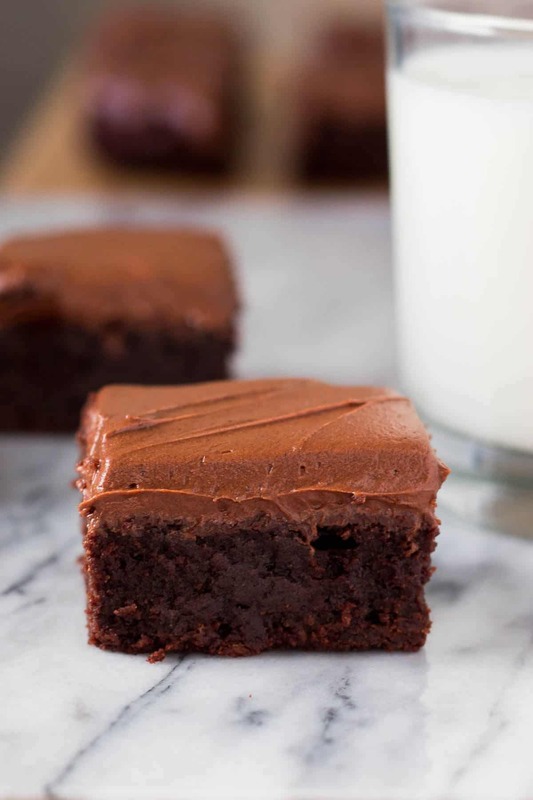 So fudgy, so delicious & slathered with a thick layer of cream cheese chocolate frosting - you NEED to make these brownies! Preheat the oven to 350F degrees. Line an 8x8 inch square baking dish with aluminium foil leaving an overhang on each side and spray lightly with non-stick cooking spray. Alternatively, line the pan with parchment paper (do not spray with cooking spray if using parchment. Set aside. In a large microwave safe bowl, melt the butter in short bursts. Once melted, stir in the corn syrup using a large rubber spatula or wooden spoon and allow the mixture to cool slightly. Stir in the vanilla & cocoa - and if there are clumps of cocoa whisk the mixture until it's smooth. Then Add in the eggs, egg yolk & sugars and whisk until combined. Be careful to only whisk the batter until combined and not continue mixing past this point, otherwise the batter will become more cake like because more air is added. Finally fold in the flour and salt using your large wooden spoon or spatula. Pour the batter into your prepared pan and bake for approximately 30 minutes. The top of the batter should look set - but you won't need to bake past this point. I usually start checking at about 27 minutes. Remove from the oven and allow the brownies to cool in their pan at room temperature. Once the brownies are cool, make the frosting. In a large bowl using a stand or hand held electric mixer, beat together the butter and cream cheese on medium speed until combined and no lumps remain. Turn the mixer down to low and add in the cocoa. If you prefer a stronger chocolate flavor - add 1/3 cup but if you prefer not quite so strong add only 1/4 cup. Once combined, add in the powdered sugar about 1/2 cup at a time until the desired consistency is reached. The frosting should be thick, but definitely thinner than frosting used for piping. 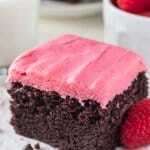 If your frosting seems too thick - add 1 tablespoon of milk or cream. Finally, beat in the vanilla and salt. Lift the brownies from the pan using the overhang of parchment or aluminium foil and peel back the edges. Frost the brownies using a thick layer and cut into squares. I made 16 total. Thanks! Making them now and can’t wait to try them. They look wonderful! It was good but a little too salty tasting for me, 1/4 t salt in batter& 1/4 t in frosting, next time i will leave out salt in the frosting. hi, can i use honey instead of corn syrup? Yup – that would be fine! Love these! My hubby said “best brownies ever” so I think it’s a win! Only question is.. are they supposed to be refrigerated by of the cream cheese icing?